music news scotland - FESTIVALS! where the festival began in 2014, adds, “For the past few years I’ve been desperate to bring the festival back home to Scotland, and we’ve had a lot of local support to help make it happen. “We had a sneak Doc’n Roll Scotland preview at a sold-out screening of Rudeboy: The Story of Trojan Records at The Cameo in December. After the Edinburgh weekender in April, we’re finalising plans for Glasgow in late June. I have high hopes to tour Doc’n Roll across Scotland, and who knows - I may even set something set-up in my beloved Fife in the near future!” Doc’n Roll is supported by the BFI Audience Fund using money from the National Lottery to grow audience appetite and enjoyment for a wide range of independent British and international films. Edinburgh Tradfest has announced its full programme for the 2019 Festival. Now in its 7th year, Tradfest, held at various locations across the city, mixes the very best in traditional music, world cinema celebrating folk culture, and storytelling. This year’s music programme kicks off on 26 April at the Queen’s Hall with anarchic Irish folk band Lankum and continues for the next 11 days with - What A Voice, celebrating female tradition-bearers with music from three of Scotland’s most engaging and accomplished singers – Kathleen MacInnes, Fiona Hunter and Kaela Rowan; the fiery Scandinavian fiddles and bubbling Northumbrian pipes of Baltic Crossing; Johnny Campbell and the Brothers Gillespie in concert at Leith Depot; the May Erlewine trio from Michigan; the award-winning dynamic folk quartet Gnoss; Celtic-harpist Savourna Stevenson performing with saxophonist Steve Kettley; fiddler Adam Sutherland in a double-bill with the explosively energetic Talisk; a celebration of Gaelic Spiritual Music, in memory of John Macleod, in Gloir at the Usher Hall; acclaimed folk artist Heidi Talbot presenting contemporary Swedish folk artists Väsen, (French harpist, fiddler, pianist and vocalist Floriane Blancke, and one of Fair Isles’ finest musicians Inge Thomson); bluegrass from Grammy award winner John Reischman and the Jay Birds; and Canadian supergroup The Fretless. Jamie Chambers from the Folk Film Gathering said: "The Folk Film Gathering are privileged to remain part of Tradfest's broader celebration of folk and traditional arts from Scotland and further afield. Since its inception, Tradfest has been at the forefront of exploring the ongoing place of folk culture in contemporary Scottish life, and we are very pleased to be able to contribute to that, in exploring the part that cinema might play within that conversation." Donald Smith, Director of the Storytelling Centre said: “Tradfest gets a fresh boost this year with Soundhouse taking the promotional Douglas Robertson, Founder of The lead. They are champions of Edinburgh’s music Soundhouse Organisation and Programmer scene, and with partners such as the Scottish of this year’s Edinburgh Tradfest said: “This Storytelling Centre and Queens Hall aboard, this year’s programme mixes the very best Festival of folk arts looks set to go from strength traditional music with unique and inspiring to strength.” events across storytelling and film. We are Alan Morrison, Head of Music at Creative thrilled to be organising the festival this year, Scotland said: “Edinburgh was at the heart of and look forward to seeing what local and the Scottish folk revival in the 1960s. Since international artists bring to this wonderful then, the capital’s folk scene has been nurtured festival.” by passionate and dedicated souls at the likes of Lankum who play the Queen’s Hall on Edinburgh Folk Club and TRACS. Tradfest has Tradfest’s opening night said: “It’s a flown the flag for traditional culture more widely pleasure to be involved with Tradfest and always since 2013, and I’m delighted that the festival fun to come back to Edinburgh. There’s always a will continue under the direction of The Soundhouse Organisation, who themselves have worked wonders in keeping the city’s live music scene alive year-round. Scotland’s folk and trad music sits at the core of our cultural identity and is a driving force in our dynamic music industry. It’s great to know that Tradfest will continue to showcase this brilliant music to audiences from near and far.” take over the reins from TRACS at the Scottish Storytelling Centre. Tradfest runs from 26 April to 6 May 2019 and is managed by The Soundhouse Organisation and supported by Creative Scotland and the City of Edinburgh Tattoo Culture Fund. A bonus ‘sneak preview’ afternoon concert in Dundee and free family music taster session have been added to the programme of Northern Streams festival of Nordic and Scottish music, song and dance at the end of this month. the Faroe Islands as we’ve not yet had anyone Celebrating its 16th year and taking place 25-28 perform at the festival from there. 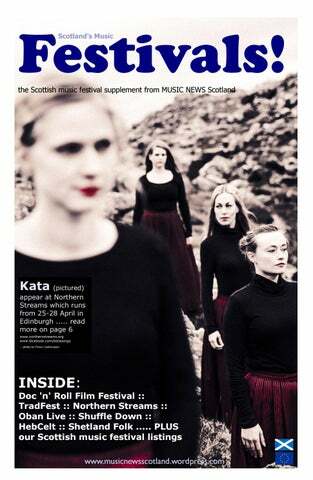 Kata have an April, Northern Streams, features as guests: amazing, enigmatic way bringing old songs to Kata :: a five women group who sing traditional life with intriguing stories from the Faroese songs from the Faroe Islands in a striking tradition. I’m also pleased to have some of the manner young Swedish musicians who delighted festival audiences last year, returning to play and sing in Caolmhar :: a group of four young people from Caolmhar. And it’s great to be able to showcase Sweden that play a range of Nordic & Scottish the talent that Scotland attracts to study here, music and songs. 3 of them come from V-Dala especially people who have a shared interest in Spelmanslag – Sweden’s longest-running exploring the Scottish and Nordic traditions with student folk ensemble & three times student the trio of Jocelyn, Rav & Ellen.” world champions! The festival opens with ‘sneak preview’ Jocelyn Pettit with Rav Sira & Ellen Gira :: a afternoon concert in Dundee on Thursday 25 trio of top young musicians studying in Scotland, April, then in Edinburgh an evening concert on from Canada, Norway and the USA, who enjoy Friday; workshops, a concert and ceilidh on playing both Nordic and Scottish music. This will Saturday – to give you the opportunity to try be their first headline concert since forming. Nordic dances alongside the Scottish ones you Organiser, Fiona Campbell, said: “I really are likely to know already. All dances will be pleased we’ve been able to invite artists from called or demonstrated. There are workshops during the day on Saturday, including the free family music taster, covering tunes, songs and dances from Scotland, Sweden, Norway and the Faroe Islands. The workshop period ends with the Sharing Session we recently started where all the invited guest performers and participants get a chance to share what they have learnt from the workshops and performances. A second free open session finishes the festival on the Sunday afternoon. (This session inspired the development of a monthly Nordic on the fourth Sunday of the month which will coincide with the festival in April). All events take place at the Pleasance, 60 The Pleasance, Edinburgh EH8 9TJ. Ticket prices range from £6 for a workshop – £35 for an allin-one weekend ticket. Concessions include TMSA members & Young Scot cardholders. See www.northernstreams.org to book online and for other ways to buy tickets in advance including in person. (Tickets are only available at the venue during the event). Northern Streams is organised by the Traditional Music and Song Association (TMSA) Edinburgh & Lothians Branch. The Traditional Music & Song Association of Scotland (TMSA) was formed in 1966 as an organisation to promote, present and preserve the traditional music and song of Scotland. Details about the Branch @ www.eltmsa.org.uk and TMSA @ www.tmsa.org.uk Thanks to support from individual donations, Torshavn Kommunar, Bilda plus the Edinburgh Old Town Development Trust (EOTDT) & City of Edinburgh Council Southside/Newington Community Grants & Local Events fund. For more details of the Northern Streams programme email: eltmsa@yahoo.co.uk call 0795 191 8366 or check the website and social media links below. Major Argyll music concert Oban Live has announced the shortlist of Scottish acts that have made it through to the final stage of its nationwide talent competition. Musicians from all over Scotland entered the Scottish Sea Farms Unsigned Oban Live competition throughout March. Leading salmon grower Scottish Sea Farms teamed up with the event, which is Argyll’s largest outdoor live music concert, this year to give talented musicians the opportunity to win a stage slot at the rural stadium gig this June. The winners will also win £300 towards expenses and a slot at the Official Oban Live After Party at The View, Oban. Two slots at Oban Live 2019 are up for grabs, with one winning act being from the local area of Oban and one from the rest of Scotland. The panel of judges, which included BBC Radio Scotland’s Vic Galloway, selected a shortlist from each category and both shortlists have now been put out to the public to vote for their winners. Commenting on the shortlist, Scottish Sea Farms’ Heart of the Community Coordinator Georgie Mackenzie said: “Securing a stage slot at Oban Live, which draws an audience of thousands, is a huge break for up-and-coming artists. We’re genuinely thrilled to be playing our part in supporting both local and Scottish talent, something we put a lot From the local category, the eclectic shortlist includes into with regards to our own teams, and we’ll be rapper S-Mac, The Argyll Ceilidh Trail, Crackin’ Craic watching with interest to see which two shortlisted and alternative rock artist 4Below, all from the area acts go on to win the public vote.” of Oban. The winners will join a whole stream of international Making it through to the Scotland wide category is Celtic, rock and folk acts confirmed for the 2019 November Lights (Monifieth), Lisa Kowalski (Paisley), event, attended by thousands on June 7 & 8, The Youth and Young (Fife), Banshee (Renfrew) and including Skerryvore, We Banjo 3, Red Hot Chilli DMS (Edinburgh). Pipers, Lucy Spraggan and more. You can vote on the weblink above and the webpage has videos and information about each act. Voting closes at 12pm on Monday, 22 April. Tickets :: Friday April 26 & Saturday 27 April - Friday starts 7pm, and Saturday 1pm and tickets are priced at £12+bf for Friday night, £20+bf for Saturday and available from the link above. Two former music students who are now performing on the international stage have secured a coveted slot at the renowned Hebridean Celtic Festival this summer. Jamie MacDonald and Christian Gamauf will join the likes of KT Tunstall, Tide Lines and The Shires in the HebCelt line-up after winning a competition for young talent organised by the festival and Lews Castle College UHI, part of the University of the Highlands and Islands. The competition was open to any performer or band which included members who are studying, or who have studied, on one of the college’s music programmes. Fiddler Jamie, from Tiree, and piper Christian, from Loipersbach in rural Austria, are BA Applied and the BA Applied Music. Music degree graduates. They met six years ago “We haven't been to HebCelt before, but we've while studying in Benbecula and began playing heard lots of great things about it. Jamie is also together at local concerts. playing with his other band Eabhal, and we can't Since then they have appeared at a number of wait to play at this festival in such amazing high-profile events and last year released their surroundings.” debut album, ‘The Pipe Slang’, which was HebCelt director Caroline Maclennan said: longlisted for Album of the Year at the Scots “Jamie and Christian were up against some very Trad Awards 2018. strong competition, but their musicianship shone They have just returned from New York, where through and they are very worthy winners. they performed at Tartan Week. Other recent “We are passionate about promoting young highlights include playing at Celtic Connections talent, particularly acts that have their roots in in February and at the Lorient Interceltic the islands, and we are very much looking Festival, Europe’s biggest Celtic festival, in forward to seeing them at the festival.” Brittany, last year. Christian, who also spent time on Cape Breton Island in Nova Scotia, won Glasgow University’s Commun Oiseanach Piping Competition in 2016 and draws on both the Hebridean and Cape Breton styles in his playing. Jamie is also a member of folk band Eabhal, who were named Hands Up For Trad, Battle of the Folk Bands 2018 winners, and are also appearing at HebCelt. “Jamie and Christian are graduates of the BA Applied Music degree and are busy performing on national and international stages. We look forward to them bringing it back home to the Hebrides where they began their musical journeys together.” HebCelt 2019 will be held from 17-20 July. It will feature almost 30 international acts in the main arena programme, as well as events in various venues in Lewis and Harris. Lews Castle College UHI is sponsoring the festival’s acoustic stage for the third year in succession to strengthen its cultural, artistic and educational ties with HebCelt. Anna-Wendy Stevenson, programme leader, BA (Hons) applied music, at the college, said: ‘We are delighted that Lews Castle College UHI has been able to work with HebCelt to offer this fantastic opportunity for our students and graduates. Local music fans can start marking their diaries and pencilling in their dates as the Shetland Folk Festival announces its local artist lineup and concert programme this week. The 39th festival is even bigger this year with an increase in concerts, capacity and a range of one-off special showcase events leaving something for everyone. Over forty local acts will perform across the length of the islands (from Bigton to Baltasound) as well as the fifteen visiting artists announced last month. As usual, the local line-up gives a nod to the past, present and future of Shetland music featuring ‘weel kent’ local favourites alongside brand new bands and performers. Friday at a special ‘Stories behind the Music’ concert curated by local musician and broadcaster Claire White. This will also feature Shetland Fiddlers Society, Papa Stour Sword Dancers and songs from White’s new album, ‘A Lasses Trust in Providence’. recently we felt we needed to create a bigger platform for Shetland music and hopefully this can be seen in the concert line-up. We are particularly looking forward to the special showcase concert at Mareel and the chance for our young musicians to see someone like Jenna Reid, who has shown what talent and dedication can bring.” Other local favourites such as Haltadans, Vair, Sheila Henderson & Freda Leask, Fjanna, Shetland Mandolin Band, Girsie’s Loose Ends, Herkja, who wowed audiences on their first festival appearance last year and many more will perform over the weekend with party bands such as First Foot Soldiers, David Sandison’s Tennessee Wannabees and Isaac Webb Trio performing late night slots at the Festival Club through it all. In terms of themed concerts, three of the finest singers from across the Atlantic will perform on Sunday afternoon’s ‘Voices of Canada’ show featuring JP Cormier, Kaia Kater and Pharis & Jason Romero, while jazz fans can see French swing quartet, Les Fils Canouche alongside local jazz musicians that same day. Sunday night will see the now legendary Foy concerts featuring the vast majority of visiting performers from the weekend and the festival weekend's venue sizes will range widely from Friday’s ‘Spanging Spree’ at Clickimin featuring Rob Heron & The Teapad Orchestra, Kinnaris Quintet and Elephant Sessions to more intimate song nights at The String featuring acts such as The Jaywalkers, May Erlewine and local festival debutantes, Trevor and Eva and Trio o Dem. Other events to look out for include children’s concert, ‘Peerie Spang’ featuring Bon Debarras, Kabantu and Anxo Lorenzo as well as workshops and sessions in the festival club and the return of the Norwegian tall ship, Statsraad Lehmkuhl as a live venue over the weekend. Glasgow’s longest running music festival and music fans across the city won’t be far from unmissable live jazz with a diverse and exciting programme. The Glasgow International Jazz Festival was founded in 1987, when Glasgow was bidding to become the European City of Culture for 1990. The City had studied the competition and worked out that all major cities in Europe had a jazz festival. If they had one, then so should Glasgow. From the very beginning, the Glasgow International Jazz Festival brought some of the biggest names of jazz to the City. The annual Inverness-based XpoNorth, formerly goNORTH, is Scotland’s leading creative industries festival and offers delegates access to an exceptional creative programme. The conference and showcase take place over two vibrant days and nights in the Highland capital. 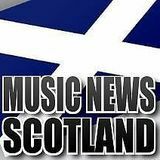 SCOTTISH MUSIC FESTIVALS to be included in our festival listings email details to: musicnewsscotland@gmail.com festival that will help mark its 10th edition. 2019 will see the 2000 capacity festival celebrate its 10th birthday and a special year of celebrations will mark the decade, beginning in January with TIREE: A Toast to 10 Years of Tiree Music Festival show at Celtic Connections. This one-off night will be hosted by Tiree natives Skerryvore and Trail West at Glasgow’s Old Fruitmarket where a number of very special guests alongside brand-new collaborations from musicians who have played the TMF stages over the last 10 years. TMF10’s line-up will also be officially announced in spectacular fashion as part of this celebratory night and remaining tickets will also be released on general sale. five-day-long festival. We are delighted to confirm our dates for our 2019 Americana extravaganza. Please watch this space for This is the sixth outing for the Linlithgow festival details on the first acts confirmed for this year. and is set to be another highlight in Scotland’s www.glasgowamericana.com live music calendar. Taking the top spots are The Charlatans and KT Tunstall (Saturday) and Deacon Blue and Wet Wet Wet (Sunday) and the rest of the weekend’s acts are sure to prove a hit with Party at the Palace regulars. It’s only 20 mins from Edinburgh and 35mins from Glasgow, Perthshire Amber making it one of the most easily accessible The Dougie MacLean Festival music festivals in Scotland. The Festival of Small Halls on the Isle of Skye brings music to ten remote village halls around the Island and Lochalsh. The SEALL Festival of Small Halls runs for eight days and includes concerts, cèilidhs and public and music workshops in halls and schools by some of the nation’s finest traditional musicians. See in the New Year at the world’s best street party as Edinburgh invites the world to share the love, embrace friends – old and new – and celebrate the New Year in the home of Hogmanay. Get 2020 ready now - take advantage of our Early Bird discount with tickets for £20.00 + £1.00 booking (limited availability). Organisers are promising a real "Feast of Folk" at this year’s festival. Planning for the Linlithgow www.edinburghshogmanay.com Folk Festival in 2019 is now underway. Our programme is launched annually in July and will be available here at that time. Celebrating it’s 10th Anniversary in 2019 Bathgate's 'Party in the Park' is a yearly family focused music festival with two music stages, childrens rides, free face painting, food, stalls, and lots of fun - it's held in the town's Kirkton Park. There is a main stage and acoustic stage www.seall.co.uk/small-halls with music on both throughout the day with free entry and no ticket required. A real mix of music Edinburgh’s Hogmanay from local bands and artists to those further afield. There is no ticket required and no entry Edinburgh fee and as this is geared towards families there 31 December is a strict no alcohol policy.